Designed for exclusive use with the Dimplex CFH range of industrial fan heaters. The CFCH control system provides central control over multiple fan heaters connected via the simple electronic control bus system fitted to all CFH range heaters. With building heating requirements up to 120kW, this control system has a number of key features for convenient automatic operation in larger buildings. Multiple heater control - Using standard PC network cable allows control over 10 heaters as one. Fan & heat selection - Independent control with graphical display. 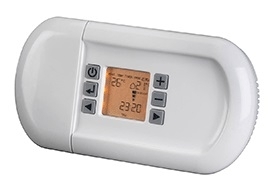 Electronic room thermostat - Ambient & target temperature display with 1°C adjustment steps. 7 day programming - Up to 32 individual time programmes available. Run back timer - Up to 5 hour delay can be set.